I got up this morning thinking that I was doing an easy 4 mile run on the treadmill. Much to my surprise when I checked my training plan I really had a 5 mile tempo run scheduled for today. I now had to switch my mindset from a nice easy run to an intense tempo run, not an easy task but I did it!! 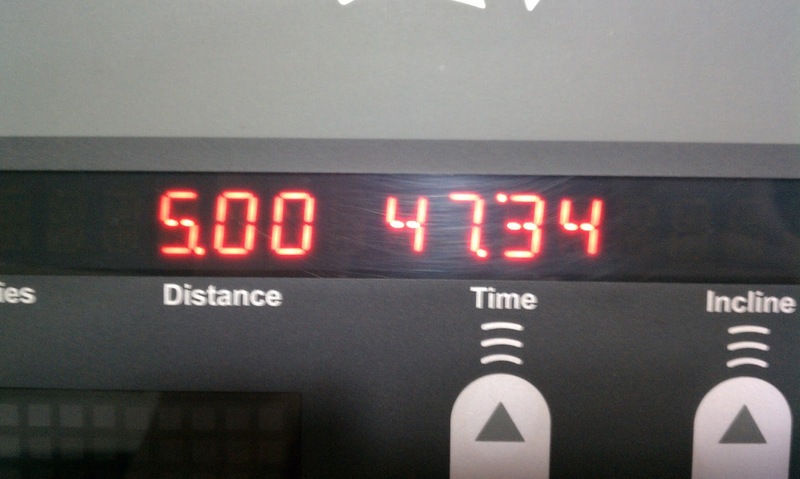 This tempo run consisted of 5 miles-1 mile warm-up, 3 miles at 8:57 pace and 1 mile cool-down. ﻿ Miles 2-4 were rough but I held my pace and I am proud of this accomplishment. I completed these 3 miles in 26:51, my fastest time since I completed a 5K 8 years ago with a PR of 26:02. Tomorrow I have an easy 4 mile run which will be a breeze compared to today’s workout. One thing I learned form today’s workout is that I need to make a playlist on my ipod of motivating songs. I have over 400 songs on my ipod and some of them are just not motivating for a tough run, therefore I will be creating a playlist this week and I will share it with you when I’m finished. What songs motivate you to run faster and longer?